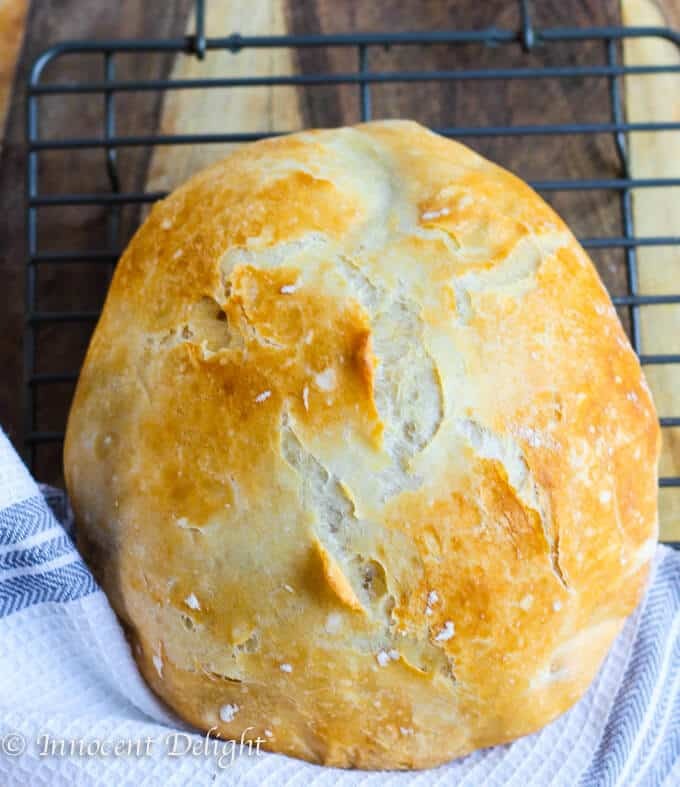 This Homemade Dutch Oven (affiliate link) Crusty Bread tastes like the fresh bread straight from the best bakery. But it comes from your oven and it only takes 10 minutes of prep time. There is no kneading involved! When I first moved to the US, I found it very difficult to find a good quality, freely baked bread. I went to the supermarket and everything I saw was in a plastic bag and tasted artificial. I was so disappointed. I missed my crusty, warm bread from the bakery around the corner, in my hometown in Poland. Even regular grocery stores had a good quality fresh, crusty bread. Bread is the number one food item in Poland; everything is served with bread. We ate bread for breakfast, bread with soup then sandwiches for lunch and finally bread for dinner. My little cousin could eat half a loaf of bread by herself in one sitting (and she’s very skinny!). Now you can understand my huge disappointment in the quality of bread found in a grocery store in the US. However, summer here was a bit easier. I found great local bread sellers in the farmer’s market, but the farmer’s markets would close in November. So, during the winters I had a huge shortage of my favorite thing to eat. To weather the winter, I found that Trader Joe’s has a pretty good sourdough bread. But still, none of this is what I remembered from my childhood – the fresh, crusty, still warm bread from the local bakery. 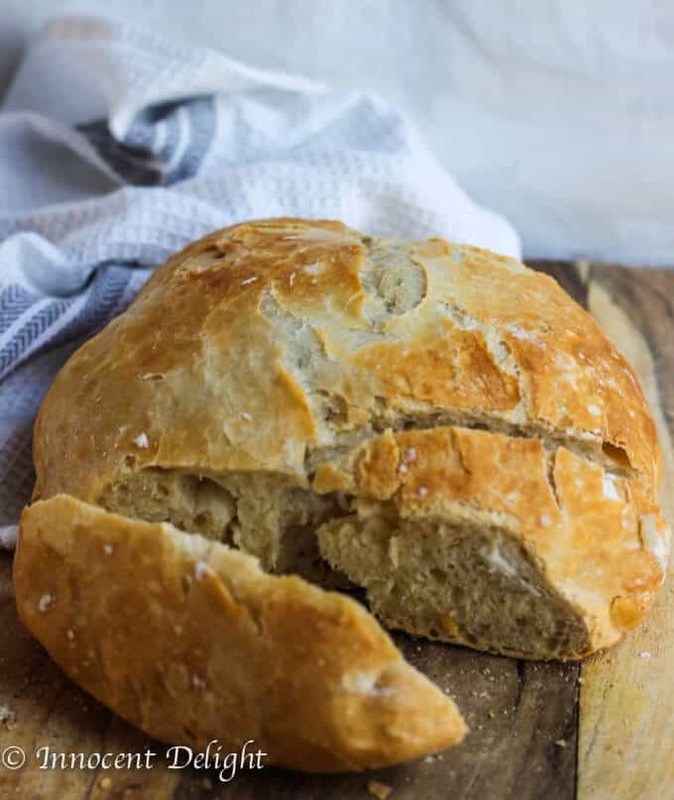 Can you imagine how excited I was when I learned that I actually can make this bread by myself, and it actually tasted exactly how I remember? 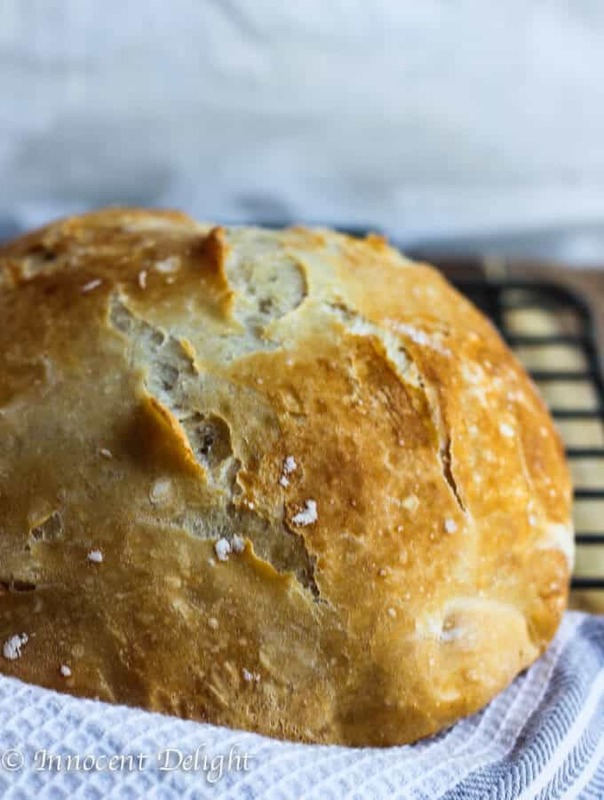 This is how ‘Homemade Dutch Oven (affiliate link) Crusty Bread’ was born in my house. Doesn’t it look amazing? I’m still so impressed with the quality of bread I was able to make. 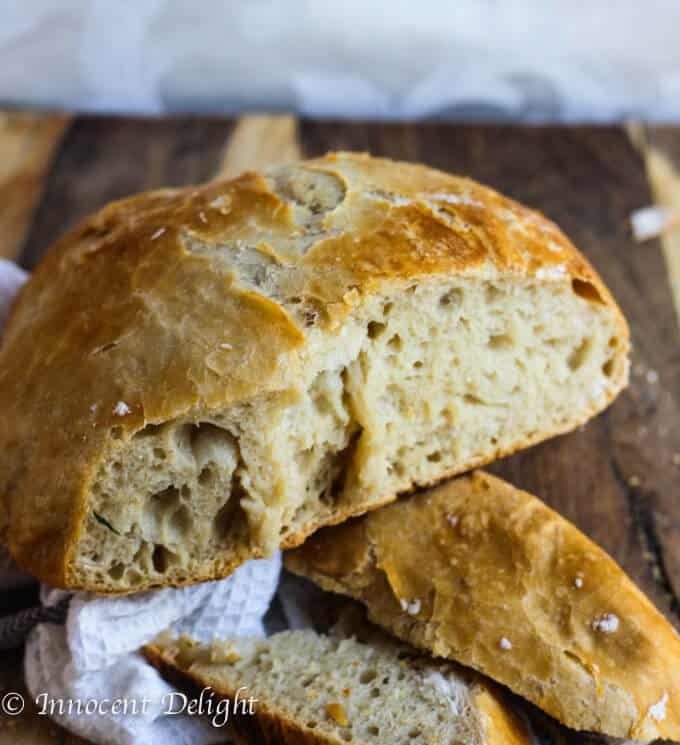 I hope you don’t mind that I’m sharing so many bread photos, but I had a really hard time narrowing down my selection of photos for this post. I have to admit it though – it took a few tries to make this bread to actually get to this point, but I feel like I’ve mastered it now. And I’m going to share it with you, so you won’t have to go through a trial and error process. Preparation is super easy. 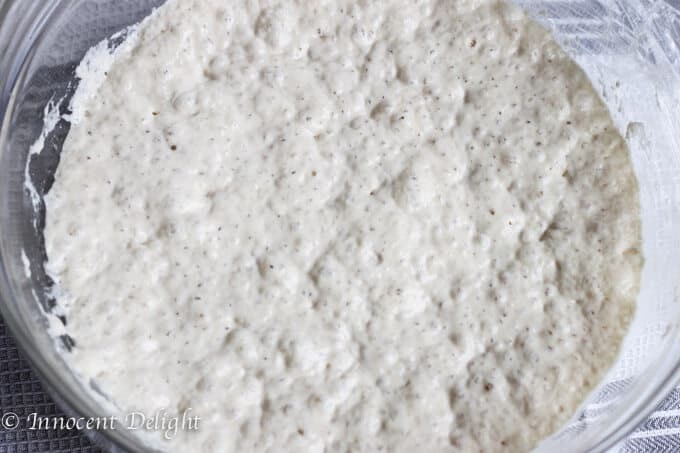 You only need to combine flour, salt, and yeast, and then add room temperature water. Mix it together with a spatula. Cover and let it rest for 12-18 hours. The next day you’ll need to heat up a dutch oven (affiliate link) and place the dough on the floured surface. 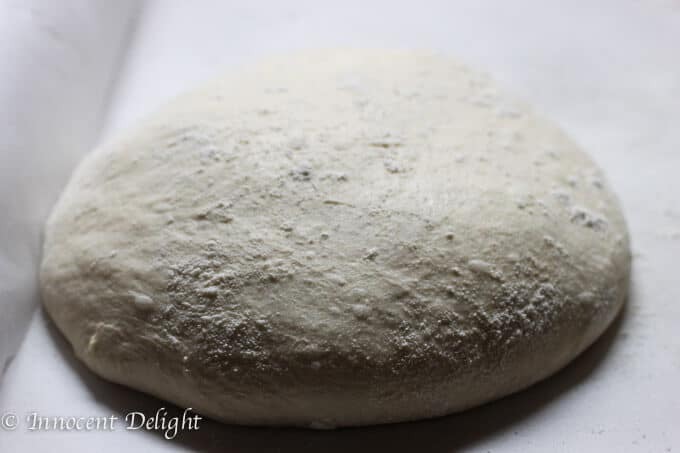 Here, you’ll need to form a ball from the dough. That’s actually the tricky part, and this is exactly where I failed a few times. I saw this recipe on Simply So Good and it wasn’t really explained how you form this ball. It just wasn’t working for me. 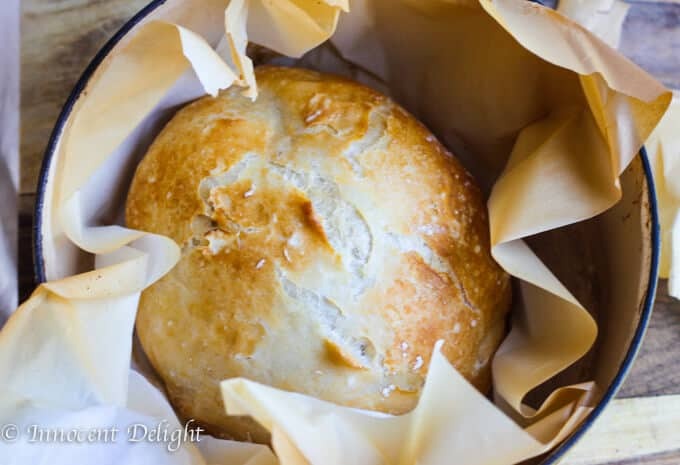 I was also placing the dough in the dutch oven (affiliate link) without parchment paper, and my bread just wasn’t rising high enough. Don’t get me wrong, the bread came out delicious, but the shape just wasn’t there, it wasn’t high enough. I couldn’t figure out what I was doing wrong. I tried different flours, different yeasts and I was still ending up with the same imperfect product. 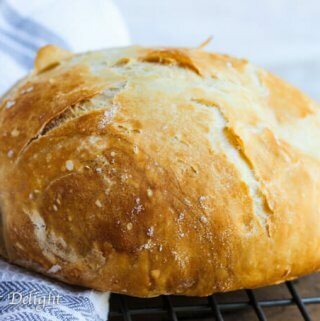 It wasn’t until I found out that the person who shared this recipe in a first place created a video with instructions on how to make this bread. It turned out that I did not use the right technic and tools to form the ball. So, once you pour your dough on the floured surface, use a vegetable scooper and fold the dough a few times. Afterward, tuck it under with your hands to form the ball. Watch this video to see exactly how she does it. Needless to say, this time the bread came out beautifully. Round, high, crusty on the outside and soft on the inside. Pure perfection! 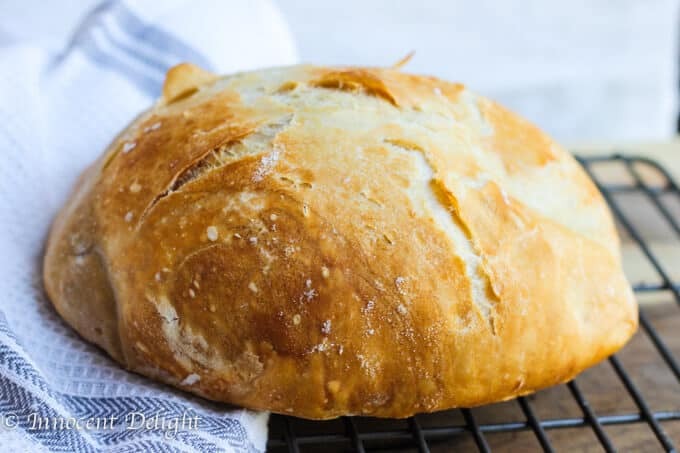 This Homemade Dutch Oven (affiliate link) Crusty Bread took me straight back to my childhood when my mom would send me to the bakery to pick up a loaf of bread. When I was approaching the bakery, the smell of the freshly baked bread was surrounding the whole neighborhood. I usually picked up one loaf and then would walk back home. The walk took about 15 minutes, but before I got home I’d have eaten half the crust, leaving the inside untouched. This crust was just so addictive. Every time my mom would get angry at me, because she didn’t know what to do with half of the “naked” bread. 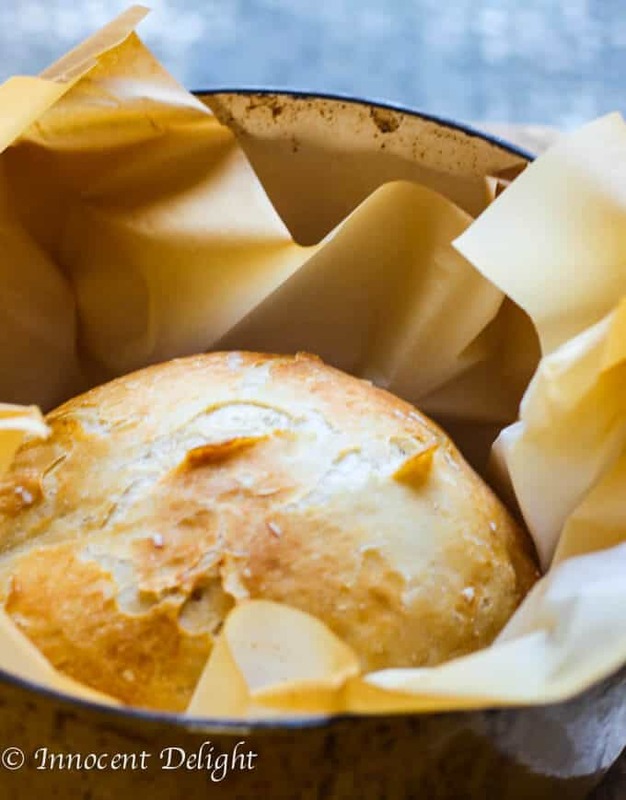 Homemade Dutch Oven Crusty Bread - fresh bread straight from the oven to your table. It only takes 10 minutes of prep time and there is no kneading involved!